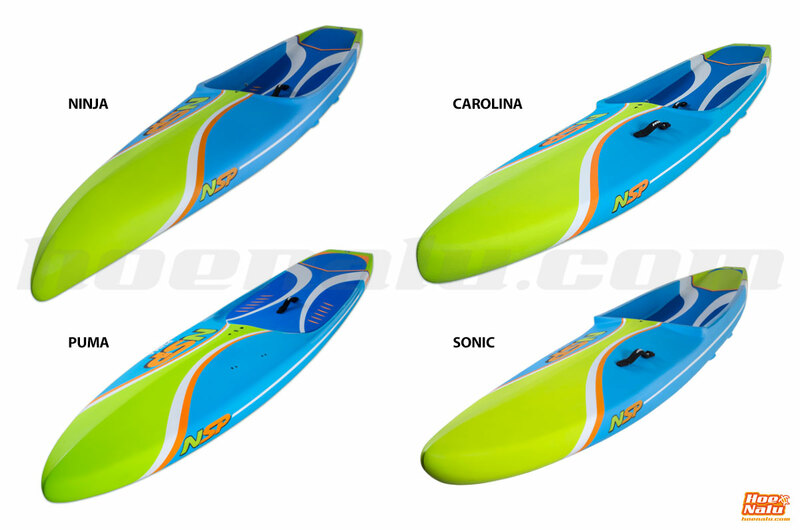 In HoeNalu we already have the first units of the NSP 2019 SUP Race boards including the new NSP Carolina, which joins the other models: Ninja, Sonic and Puma, resulting in a very complete range. With an awesome performance and improvements compared to 2018, the NSP boards are positioned among the best race boards in the market, and this week we bring you this post in which we analyze each model, changes and improvements and the measures in which they are offered. Meet the new NSP 2019 race range. NSP defines a line of shapes created for each water condition. 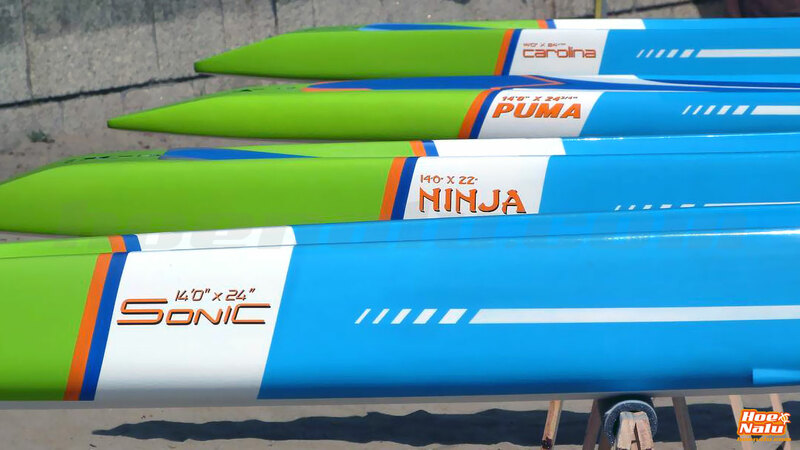 This season they repeat the Ninja model, designed for flat water, Sonic, for downwind and hard conditions, and the Puma as the versatile option between the previous two. To these three models, NSP Carolina, a model designed by NSP and its Pro rider Titouan Puyo, is added as a novelty this season. It has been named after the NSP team's good results in recent years at the Carolina Cup. 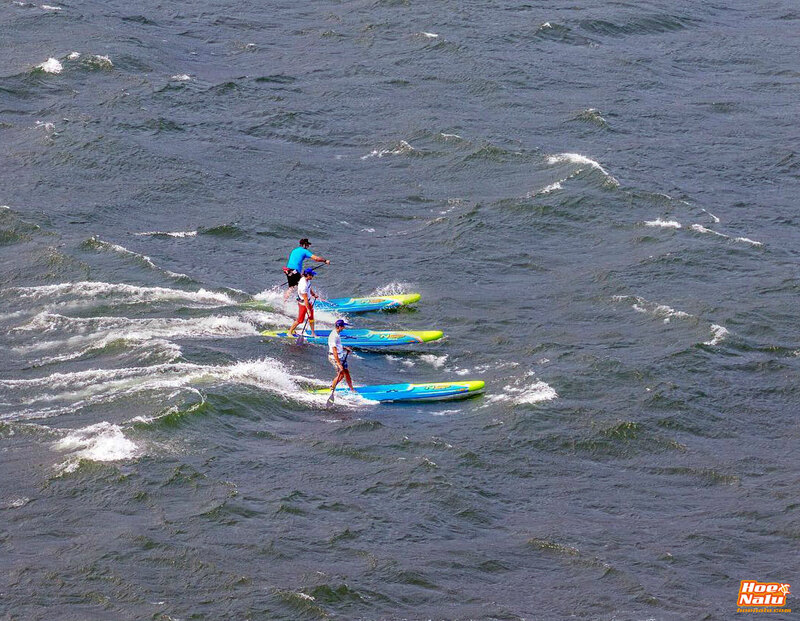 This prestigious competition of SUP race, held in North Carolina (USA), is a very technical test due to the harsh conditions of wind and waves that usually occur in April, when it takes place, and the running between the islands of Wrightsville Beach makes the riders face open water and flat water in the same race, so they need a board that performs at maximum in both conditions. The NSP brand has grown high in the last years, thanks mainly to the good results obtained with their boards by riders like Titouan Puyo, Travis Grant, Marcus Hansen, Ty Judson or Noelani Sachs. Therefore, at HoeNalu we are attentive to their news, and this week we bring you this post in which we analyze each model, changes and improvements and the measures in which they are offered, so you can met better the NSP 2019 race boards. 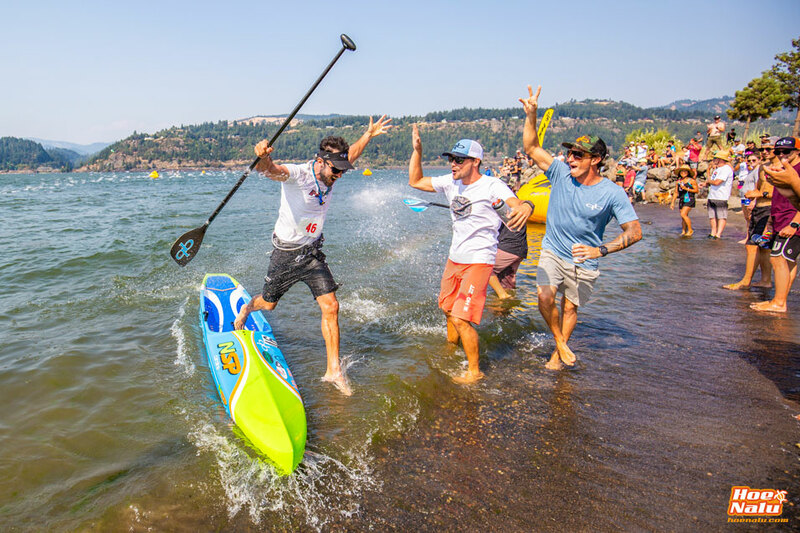 The NSP SUP Race boards are increasingly present in the Stand Up Paddle competitions, a sign that they are boards that work in a variety of racing conditions and that have excellent value for money. In this post we will analyze the novelties of each model for this year, which in addition to a slight aesthetic change, present some improvements in the design of the boards to further optimize their performance. We also present the new Carolina, the most outstanding novelty of this season in the range that brings us the Hawaiian brand. The NSP Puma is the most recognized model of the brand, especially for its versatility and its ability to adapt to the different conditions that we face. It can be an efficient board in flat water, make a great downwind without problems and even allow us to surf waves easily in the spot. 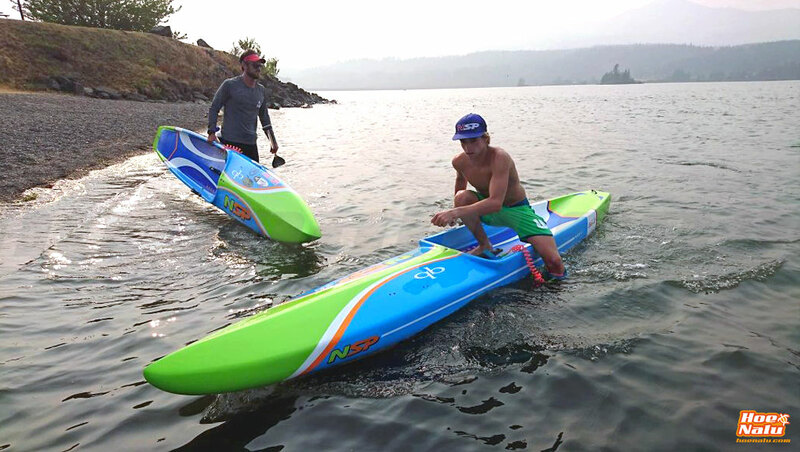 It is the perfect option for those who want to enjoy each session and each race without compromising their performance by wearing the wrong board. The Puma is chameleon and adapts to whatever the circumstance. It is also the only NSP board that does not have a recessed deck so it is more comfortable to handle if it is difficult for you to go up to the boards with the low stance. Being such a versatile and easy to use board that has such a wide range of users, NSP offers a large number of measurements in the two traditional lengths. The variations from the 2018 model are placed in the 14'x26", which has less rocker than the previous year and with a redesigned bottom to improve maneuverability in surf conditions. In addition, the new Puma 14'x24.75" has been included to complete the vacuum that existed between the 23.5" and the 26" model. In the 12'6" length models the variations have been suffered by the 22" and 23" models, which have seen their rocker reduced to benefit the lighter riders, in addition the 23" has lowered half an inch thanks to this redesign with compared to 23.5" last year, maintaining the same stability but improving its speed a bit more, especially in flat water. Without a doubt, the Puma is the ideal board for all conditions of NSP. It has its origin in the technical races with beach start, so it is designed for a comfortable start from the sand, an efficient wave step, paddling in sections with flat or choppy and front, side or back wind, and finally make the exit of the water surfing the waves. In fact, all the Puma has the NSP Surf Race 20 fin, the shortest of the NSP fins, to hurry the arrival to the beach without hitting the bottom and at the same time being able to stand up quickly at the start to paddle as soon as possible. This model also has the new design of EVA rubber pad, FCS insert for accessories, Gore valve for board ventilation and front leash plug in case we prefer to hook the leash in this position. 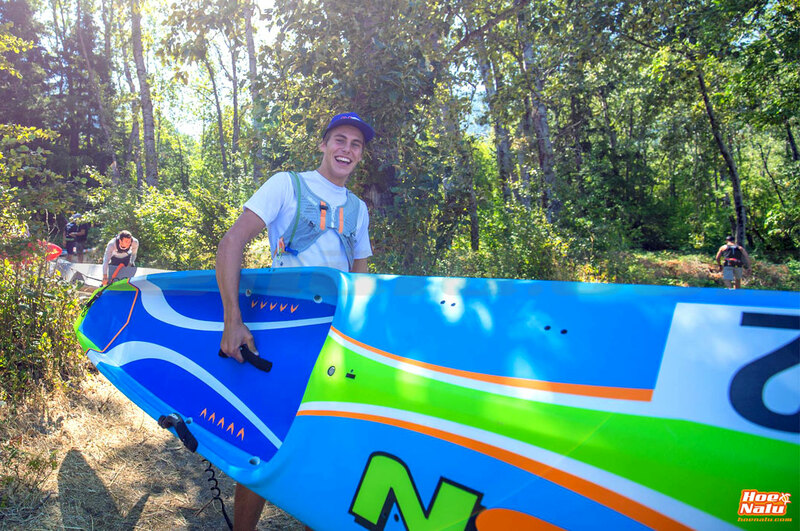 The NSP board for flat water is called Ninja, a true warrior in the water and a rocket when the conditions are ideal to take advantage of its full potential. If we think about the flat water boards of a few years ago, they have little to do with the Ninja and the models of other brands that are being manufactured for flat conditions. 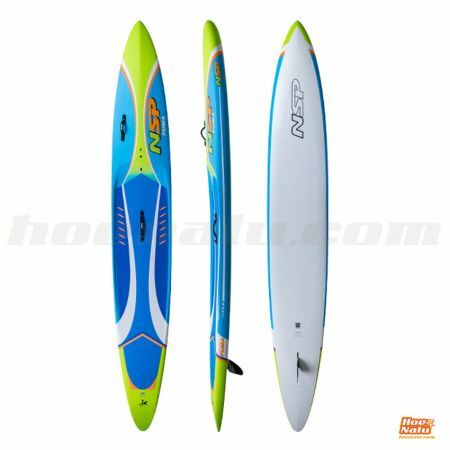 The inverted nose and the recessed deck are the main characteristics of the flat water boards that are raising the speed in Stand Up Paddle considerably. 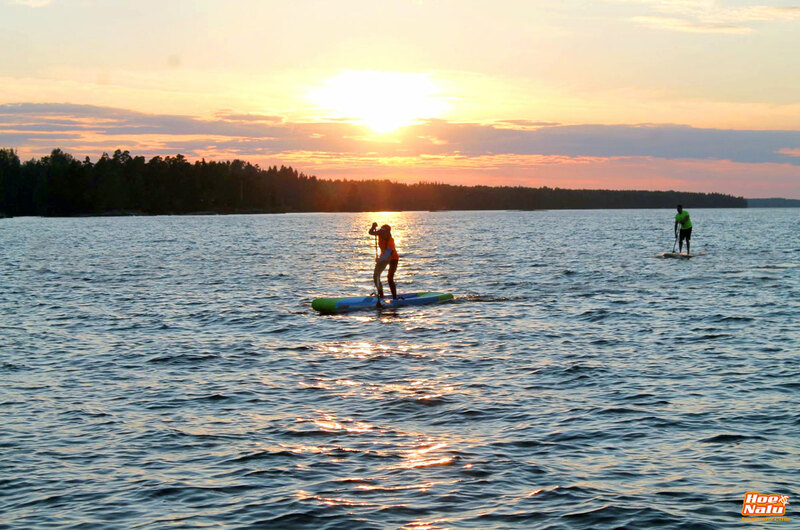 If your usual SUPing area is inland waters or a coastal area where the sea is calm most of the time, you should consider the option of acquiring a flat water board, since we assure you that it will only give you satisfaction. A few years ago we was searching a hybrid board to paddle in any condition, and the flat ones were exclusive for channels or lakes, but the new concept that the Ninja handles makes it a board that faces any situation that we find at ocean with guarantees. And it also moves at an incredible speed in the water. As we say, the Ninja features a deep deck, an element that considerably increases stability thanks to the lowering of the gravity center. It has widened and raised the tail to improve stability too, as well as to have more surface and better support in the buoy turns. This design in the stance area makes it incorporate the AVS system that includes four drainage holes for rapid evacuation of water that could enter into the tray. NSP Ninja 14'x21" (234 L) It is the option for those who seek maximum speed. It is a board that "flies" with only 21" in width, but reserved only for top riders or those with super light weight who can ride this measure without problems. For people who are going to use the board always in flat water, it can result a valid option too. NSP Ninja 14'x22" (239 L) It is the most recommended option for users who have competed for several years and want to jump to a little faster board. With just 5 liters more in volume than the previous model, that extra inch in the sleeve of the board can be decisive when going more stable over the Ninja, so it is a more viable option than the previous one for those who want to take on the challenge of using a flat board for all races. NSP Ninja 14'x24" (255 L) It is without doubt the most recommended option for the most of the users. The change to a 24" width board for a medium level rider can mean a big jump in terms of speed, especially on the shape of a flatwater like the Ninja, and can raise doubts about stability, but we are sure that the additions that NSP has included in this model will make you feel comfortable about it, although we do not recommend it as the only board if you paddle in rough conditions much of the year. The Ninja is a board that you should at least try once, to check by yourself how the speed increases with this type of inverted nose boards so striking that they act like a knife on water. In addition, thanks to the improvements of the design in terms of stability, we can use narrower boards that allow a better technique of paddling, less delay of the board, higher cadence and greater inertia, to be able to paddle more time on the same side of the board. This model includes a new high quality pad in EVA rubber with a wonderful grip and matching the aesthetics of the board. A leash plug in the front area in addition to the traditional tail. On the deck we have an insert with FCS screw to put the camera, the gps or any object safely, and below the Gore ventilation valve, which allows the board to "breathe" without absorbing moisture. Also the Ninja comes with neoprene handles and NSP race fin, the Race 22 model in all measures except in the largest of the Ninja that brings the Race 24 model, whose performance is contrasted at the level of speed, efficiency, acceleration and stability. The Sonic is the downwind board that is characterized by having a lot of volume in the nose, a deep tray and pintail, so that the whole set helps us to link the waves in the downwind with less effort than a conventional one. Obviously the Sonic is not designed only for use in the downwind, it is also capable of facing upwinds and side wind conditions with guarantees, but without a doubt, where it stands out, is when we have the wind on the back and the waves in favor, since its shape optimizes the balance between the waves and allows to maintain a high speed to hook one wave after another. One of the features that draws the attention of the Sonic just see it, is its deep tray, designed in this way to lower the gravity center of the board-rider set so that the movements produced by choppy conditions will not be an inconvenience to paddle in these conditions. On the other hand, it allows the riders to reduce the width of the board, since stability is gained by having the stance area so low, which translates into a higher speed, since the width of the board is decisive to slide more or less quickly. NSP rates this Sonic as the most stable board to date. NSP Sonic 14'x23" (292 L) It is the option for the most pro riders, those who dominate the race board without problems in hard conditions and want to reduce the width of the board to gain a few decimals to the chrono going faster with the narrowest version. NSP Sonic 14'x24" (300 L) It is the standard option. It is a board that surprises many riders, since to those who ride a 14'x26" allround board, it will not be difficult to handle the 24" width of this model, where you notice especially the extra stability in the recess of the tray. NSP Sonic 14'x25.5" (324 L) We could call it the Sonic "relaxed". It is a comfortable board, especially for those who do not need to go very fast or do not want to compete, but they love the downwind and look to enjoy each session comfortably without great stress to stay on the top of the board. For 2019 the same rocker has been maintained as the previous year mode, with the classic pintail and much rocker in the nose to face the typical conditions of the downwind. 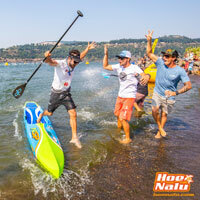 We find a redesign in the bottom, keeping the key aspects that increased stability in the 2018 model but adding certain elements inherited from the NSP Molokai, the 17'2" board that NSP riders use in the Hawaiian downwind competitions, as the Molokai to Oahu and Maui to Molokai, where such good results have been obtained in recent editions, including the victory of Travis Grant in the M2O 2018. The deep deck of the Sonic with the high tail facilitates that support in the turns and prevents the entry of water when the wave strikes behind the board. This has four drain holes that facilitate the evacuation of water from the tray if it comes in while we are paddling. In this area we have a high quality pad in EVA rubber with a grip and traction that make us feel safe throughout the session. In addition, the decoration of it is awesome, according to the board. In front of the deep tray we have a leash plug in case we want to connect the leash in the front area instead of in its traditional position in the tail, and over it and the Gore ventilation valve, we find an insert with FCS screw to place the camera , the gps or any object that we want safely. All Sonic boards come with two neoprene handles that you can mount in one of the three positions you have, two advanced sides and one central. They also have some fins whose performance is contrasted in terms of speed, efficiency, acceleration and stability, including the Race 22 option in all models except the largest of the Sonic that comes with the Race 24 fin. 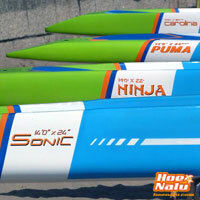 Here is the new NSP Carolina, a SUP board that we believe brings together the best of the Puma and Sonic. It could be defined as a Puma focused on high competition, although NSP defines it more as a Sonic not so focused in downwind. 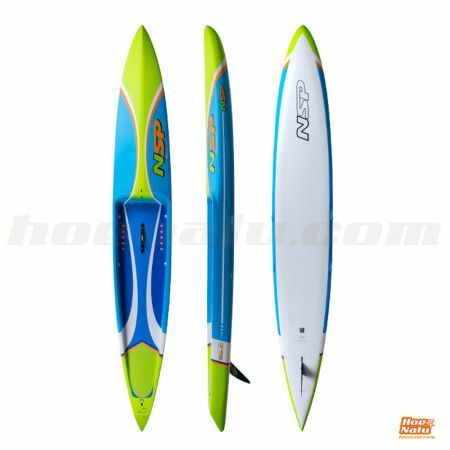 We have already told you why the name of this model is, and that this board has been designed to get the maximum in each condition without having to change the board depending how is the ocean. The nose of the Carolina is quite similar to the Sonic, in fact the rocker is inherited from the Sonic 14'x23", as well as the recessed deck that is also adopted from this model, and as we have said previously, it allows to handle narrower boards thanks to the improvements on the stability. However the tail is very similar to the Puma, because it has a rounded and wide tail to facilitate the support in the turns and move the nose quickly when we reach the buoy to take the new way. As we can see, the narrowest size in the Carolina is similar to the Ninja model, while the widest board does not reach 26", which would be a comfortable measure in the Puma, so this gives us an idea of ​​what fast this board can be thanks to the reduction of the width provided by the deep tray. Like the other NSP models, the Carolina has the AVS drainage system in the deck, neoprene handles to mount where the rider prefers, front leash plug, Gore valve to facilitate the ventilation of the board and FCS insert for accessories on the deck. Finally we review the Pro Carbon construction, which NSP uses for its race range, and which we find in the four models that we have commented. This technology employs aerospace carbon fiber along with superlight materials in the core and NSP's unique vacuum construction. This combination makes the boards with Pro Carbon technology lightest, most rigid and fastest in the market. The boards are built on an EPS SecureCell core to avoid water absorption in case of any crack in the outer structure, to which layers of 100% biaxial carbon are added both in the deck area and in the bottom. After this layer is applied another reinforced PVC in the stance area to have more resistance in the impact area of ​​the rider. The entire set is covered with a double layer of fiberglass and unidirectional carbon (UD) is added in the area of ​​the edges, which offers greater resistance than the traditional 3K or 12K and is lighter per unit of weight, so that greater rigidity is achieved in the board and an immediate response to the variations. Both the nose and tail, more sensitive areas of the board, are reinforced with carbon innegra to minimize the effect of possible touches in competition while we go in drafting. Also the fin box is reinforced in carbon to make it resistant to the possible blows that this could suffer. 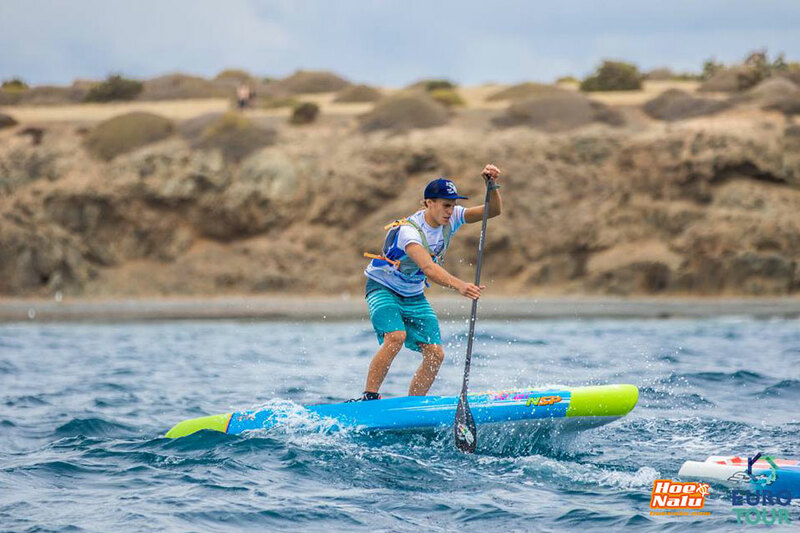 NSP 2019 SUP race boards can now be get exclusively from HoeNalu in Spain. Some models are already available for direct purchase in our online store, and the rest can be ordered upon request. If you are interested in any of the new NSP race boards, we advise you to do your pre-order before November 15th, to make sure that your board arrives, at most, in March 2019. In case you have doubts about the model that best suits your needs, or you are not sure of the size you should choose, you can contact us for advice. The board for flatwater racing by NSP. Go faster!